Tracking our business expenses is as important as tracking our incomes. Uncontrolled expenses can quickly ruin our earnings. When I started being self-employed, I didn’t track my expenses. I didn’t know what my money was going. I was afraid of expending money and very insecure of investing money to grow my business. After a while, I created a spreadsheet to track my business expenses, and I’ve been improving it since then. Today I’m sharing this automated spreadsheet with you. Why using a Spreadsheet to track your business expenses? Track your annually, monthly or one-time expenses. You can keep control of all your online subscriptions, studio rent, supplies, fees, promotion and any other expenses you might have. The spreadsheet contains a separate sheet for every year. 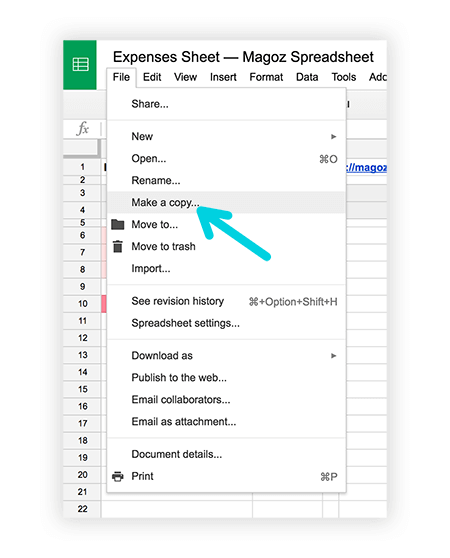 It’s very easy to set a new sheet when a new year comes just duplicating the current sheet. Having different sheets makes it very easy to compare your business expenses between years. What does the Expenses Spreadsheet include? A list for the annually fixed expenses. A list for the monthly fixed expenses. A list for one-time expenses. A list that sums all the totals. You can create a copy of my Google Spreadsheet and use if for yourself. Just follow the link and go to File > Make a copy. Using this spreadsheet is very easy. Add the business expenses you pay once a year in the annually list, add those you pay once a month in the monthly list, and those that you pay them just once in the variable list. That’s all. Everything is automated. When a new year comes, duplicate the sheet and erase the variable expenses. If you cancel or modify any of your fixed expenses, just update the spreadsheet. Accounting can be boring but is an essential part of business. The process becomes very easy using this spreadsheet. Just add the expenses immediately after you pay them. Even if you work with an accountant or a bookkeeper, using this spreadsheet will help you to be in control of your expenses and know exactly where your money is going. This spreadsheet is part of my Toolkit. It contains tools and resources for freelancers and creatives. You can download it here. What system do you use to track your expenses? I love it! I need to have one for business and another one for day to day expenses (rent, bills), that’s the only way to have a little bit of control over your finances. Thank you very much!!!!! everything is so useful !!! I always enjoy your posts here. One thing I would like to see you cover is how you work out costs (especially quoting for projects from other countries/different exchange rates).